School starts in a few days. My first semester of graduate school will involve five classes and 2 clinical observations per week. The beginnings of new things often cause OCD-like behaviors. For instance, cleaning my room more meticulously than usual, or using too many coats of nail polish, as may have been the case this time. Upon finishing a manicure, I will compulsively start pushing back the cuticles some more, creating a millimeter gap which I then have to fill of course. The first half of the summer saw me with a lot of leisure time as a result of leaving a part time retail position. Even though I’ve committed to a new position, I still have a good deal of free time. As a result, a lot of reading has been accomplished. (Thank you bf for digging out your old books!) 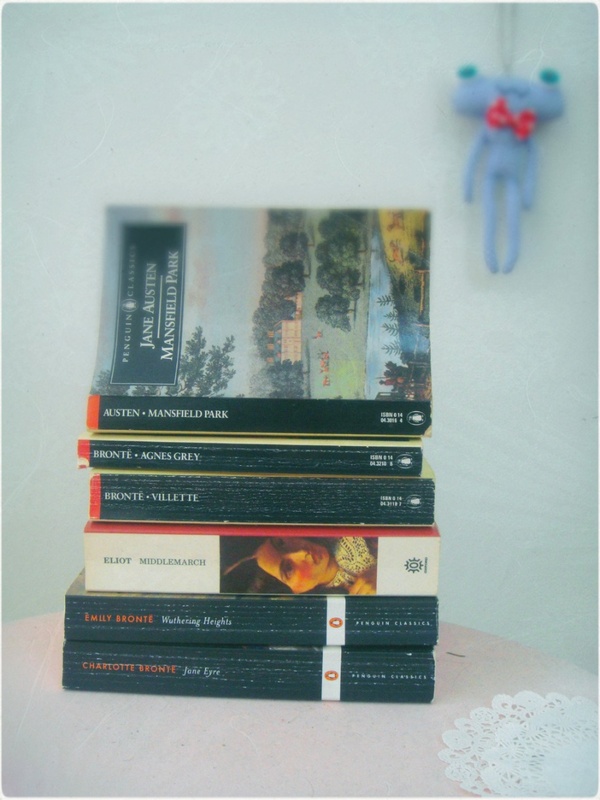 Mostly 18th Century European Classics by the Brontë sisters: Charlotte, Emily, and Anne, George Eliot (born Mary Anne Evans), and Jane Austen. Wuthering Heights stands out as the different one, being so much darker. I am looking forward to the fall when there won't be as much makeup-ruining humidity. I ordered an item off my wish list which I am still impatiently waiting to receive. Even though I anticipate being away more come October, I will still be checking in with your updates. What are you looking forward to in the coming months?